Fashion is such an important part of our lives. Not just as consumers, which most of us certainly are, but also as human beings. What I wear, I've discovered and not a moment too soon, is directly related to how I interact with the world around me. If I'm comfortable, that interaction is cool and smooth, but catch me on an off-day, with shoes that are too high and too tight, or a scratchy item of clothing and those meetings are bound to be disastrous. Yet this goes beyond how we feel in the fashions we wear. It turns out it should also be about how we make the world feel with the choices we make, voting with our wallets. 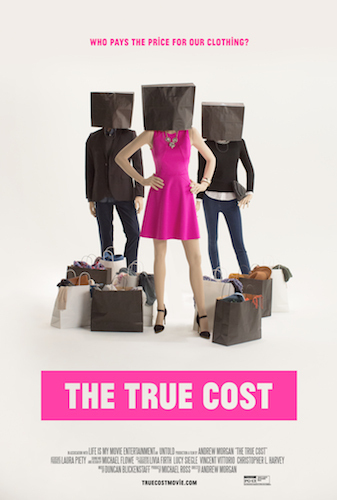 Thanks to the mind-blowingly great new documentary The True Cost by Andrew Morgan and executive produced by Livia Firth, I discovered in Cannes the impact that a new business model of fast fashion produces; this 52-seasons a year retail frenzy that affects the poorer parts of our world in such a horrific way. The culmination of this exploitation can be seen in the images of horror and destruction at Rana Plaza from 2013, where a whole factory in Bangladesh collapsed on top of its workers, mostly women, killing more than 1,100 and injuring more than 2,500. We buy a five dollar t-shirt and think nothing of it, but that ridiculously low price tag carries a flesh-and-blood toll, a human cost that should be simply unacceptable to us. And if there is one person on this earth that has been shouting this message from the rooftops, telling us that fast fashion is as unhealthy and unnatural as fast food, it is the wife of our favorite Mr. Darcy, Livia Firth. I caught up with the woman who makes me proud of my gender, but also super proud of being a fellow Italian, on the Majestic Beach in Cannes. Her beautiful voice, with just a hint of indescribable accent, as well as her class are unforgettable. Catch The True Cost in theaters now in NYC and Los Angeles, and soon in other cities near you. For all details, check out their website. As for me, I'd like to say, thank you Mrs. Firth! I will never look at clothing quite the same way again. How did you first become involved in The True Cost? 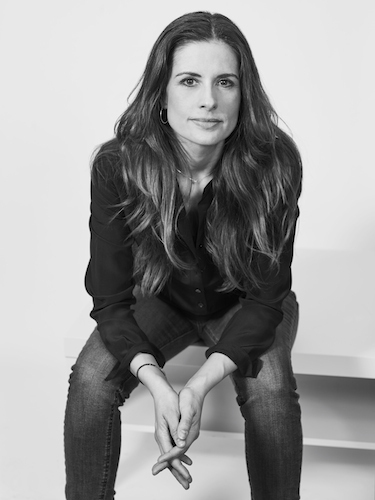 Livia Firth: I think it was a couple of years ago, Andrew had the idea of the movie already shot for Kickstarter and he had put together a trailer. And then he sent me an email which said "I know about your Green Carpet Challenge and I'm coming to London, can I come and see you and interview you?" And I checked him out and thought it looked like a cool project and said "sure come over and we'll do the interview." This is how we started and then, because he was in London, I was like, you have to talk to so and so and we started brainstorming and seeing which channels I could open for him to explore. And how did you become executive producer on the project? Firth: Andrew went on his journey, in between we did another two or three interviews, we met in Copenhagen and in Los Angeles, and every time we had an opportunity, we would meet up and see where we were, what we had discovered and what else we could explore. And then at the end, when he finished the film, he showed me the cut, we talked about it and we started working on that, and that's how I found myself being an executive producer. What are your feelings about the end result? Firth: For me this movie is an incredible weapon. The work we do at Eco-Age, I can stop campaigning now because I don't need to explain anything, people just need to see this movie and understand. One of the big things we have always done in our business at Eco-Age is never ever to separate the social justice from the environmental justice. And you can talk about the environmental impact of the fashion industry and then the eco fashion thing and green, but sustainability is about people. And when you see Andrew's movie you really realize how many hands and human beings there are and how much one of the endemic and problematic issues that we face today is slavery. And how this fast fashion system has truly enslaved countries and people in a system that will never change unless they change the business model. So it's not about how do we make it better, it's how do you change your business model so that these entire volumes can be reduced. How important is the power of one to change this? Firth: That is beautifully explained in Andrew's movie because he's the power of one! He saw some images on television that shocked him, and decided to know more. And he went on an entire journey to try and understand it. Not that everyone can make a movie but if each one of us -- and by seeing the film this will help -- really started shopping in a different way and consuming in a different way. Modern shopping is not consuming... Obviously this is fashion but it can touch on food too. We all know about fast food but no one talks about fast fashion. And it's the same. If each one of us started consuming differently and as consumers we are hugely powerful because each time we buy something it's our vote, so we are voting every single time we open our wallet and take the money or the credit card out. How did we get here, to this impossible model of fast fashion? Firth: Because we have been brainwashed. We have been, in the last fifteen, twenty years, to think that it's democratic to buy a t-shirt for five dollars. What about people that have no money? OK, I'm forty-five, when I grew up there was no fast fashion. So how did I, a little kid from a family where my father had four kids, we had no money, and yet I went to parties, I went to work every day, when I was in my teens, and twenties, twenty-five, how did I buy and shop? Very, very differently. Back then, in fact, if any of us ever saw a t-shirt for five dollars in a shop we would have not touched it because we would have thought, my God, no matter who produced it, it must have been made in such a poor way to be costing only five dollars! Today, they flipped our perception so now we think it's a bargain we have to have it, it's so cool and the kids -- the fifteen year-olds, the twenty year-olds -- today think that it's completely normal. So should I, as a consumer, never look at fast fashion again? Firth: You can still buy your H&M clothes, if you buy one. The problem with -- now we're talking about H&M but it can be Zara or any other fast retailer -- is the way that they've been making us addicted to this cycle of buying fast, and immediately. Because we can all go into H&M one day and go "Oh, I'll buy this dress, it's so affordable, it's so nice and I just saw it in Vogue and this is so similar!" But you buy without thinking and you buy a lot. Most people go to H&M and Zara once a week, once every couple of weeks. But if each one of us went to those stores once a month, that would be the strongest message we as consumers could send to these retailers. Slow down. Because unless you slow down the people that produce you clothes will never ever ever be treated properly and fairly. Ever. All images courtesy of the filmmakers, used with permission.